All proceeds go to Arts Umbrella, an organization that makes arts accessible to children. A raffle will be held with over 10 prizes worth over 200$. The bar will serve beer, wine and some specialty cocktails. Space is limited and tickets will sell fast! So get your tickets early! 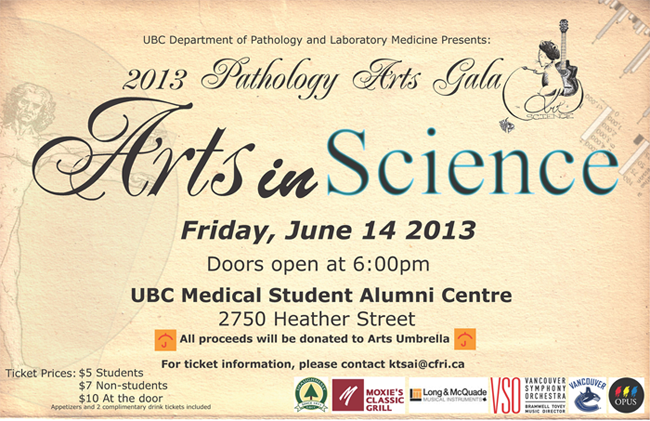 The UBC Department of Pathology and Laboratory Medicine would like to formally invite its faculty, staff, students and any other affiliated persons to showcase their visual and performing arts talents at the Pathology Art’s Gala, an evening of drinks, food, art and people, to be held June 12, 2012. This fun event encourages department members to appreciate and get to know each other on a new level! Those interested in submitting their original art work for display or performing at Pathology Art’s Gala should contact Chansonette Harvard (charvard@cfri.ca) and Clarissa Pasiliao (cpasiliao@gmail.com) for additional details. All levels of entries are welcome. Tickets: $5 for students, early bird non student $7, At the door $10. Recommended donation $10. This year’s third annual Art of Science Pathology Department gala was another overwhelming success. With over 150 attendees the MSAC was once again filled to capacity as the evening began. Visual art exhibits were on display from both faculty (David Walker) and students (Agatha Jassem, Dian Sulis, Hayley Spencer,Jasemine Yang, Penny Slack & Varun Saran) and even some lab managers (Galina Soukhatcheva – Verchere lab & Xiaoxia Wang – Tan lab). The performing artists’ show featured some familiar faces from previous years. Ash Marwaha returned to belt out some Frank Sinatra classics accompanied by Amy Cheng on the piano. Lisa and Marie Ang also returned this year joined by Andi Bruneski to share with us their angelic voices. Susan Porter became the only performer to have taken part in all three gala years with her piano performance of Ash Grove by J. Martin. Some new talent was also on display. David Ng had the audience in stitches with his particularly apt scientifically themed comedy reading. Collette Chu accompanied her friend Crishnalyn Delieva to bring us another angelic rendition of the disney classic ‘Colors of the Wind’ and Amy Cheng displayed her professional music talent on the piano. The show was closed by a group performance by the CFRI choir Vocal Chords (Ash Marwaha, Ashish Sharma, Bruce Verchere, Kate Potter, Lynn Huang and Clara Westwell-Roper) singing the popular classic ‘Don’t Stop Believing.’ However, just before the curtains came down, once again we were treated to David Hardwick’s impromptu performance on both the piano and banjo. The evening was enjoyed by all and once again managed to raise over $1000 for local children’s charity Art’s Club. A big thanks to committee members: Varun Saran, Melissa Grier, Colette Chiu, Lisa Ang, David Walker, Agatha Jassem, Alon Hendel and Emily Vucic. The Art of Science evening promises to uncover and expose the wealth of artistic talent in the Pathology Department for many years to come. Lights, Camera, Action! The Department of Pathology and Laboratory Medicine hosted its second student-organized Evening Arts Gala, ‘The Art of Science’ on June 11th. Building on the success of last year’s inaugural event, Dr. David Walker and a core group of dedicated Graduate Students helped organize and run the evening that shared the artistic talents of individuals in the Department. This year’s line-up of artists was both diverse in background as well as the media employed. On the main stage were several musical performances including singing, piano and guitar, and new this year, a short play as well as a book reading by author Rosemary Fitzgerald. The generous support from our Department and Firefly Fine Wines & Ales allowed guests to enjoy a range of food and drinks over the evening and the modest admission prices allowed the organizing committee to donate over $1000 to the local Arts Umbrella youth charitable organization. Many additional sponsors provided support through door prizes and a raffle during the evening. Special thanks are made to the hard working organizing committee who planned the event over several months: Agatha Jassem, Ashish Marwaha, Audra Vair, Penny Slack, Timon Buys, Lisa Ang, Angela Burleigh and Tyler Hickey. The 160+ guests in attendance were able to enjoy a range of art forms including photography, drawings, paintings, fine woodworking and even a few stone sculptures by Dr. Walker himself. Within the Visual Arts students displaying their photographic efforts included Penny Slack, Agatha Jassem, Maite Verreault and Tyler Hickey. Original paintings were also displayed by Audra Vair and Leah Prentice. Additionally, Timon Buys contributed a comedic opinion writing for the evening. Musicians performing during the evening included Alice Kuo (flute, with piano accompaniment), Motoi Matsukura (piano), Henry Stringer (guitar), Angela Beckett (bagpipes) and Azadeh Arjmandi (piano). Department Head, Dr. Rick Hegele, also contributed a three-selection offering on the piano, and the evening wrapped up with an impromptu sing-along by former Department Head, Dr. David Hardwick. Special thanks are given to Dr. Walker and the hardworking graduate students who helped to organize this event over a four-month planning period. The event planners included Krista Fogel, Audra Vair, Motoi Matsukura, Alice Kuo, Agnes Klimek, Ciara Chamberlain, Agatha Jassem, Leah Prentice and Tyler Hickey. For tickets, please contact Sigrid Alvarez at salvarez@cfri.ca.